And so it came to pass, on the 31st day of May, in the 239th year of our nation’s independence, that my name was called on a motion for admission to the bar of the Supreme Court of the United States. Chief Justice John Roberts, in his infinite wisdom, granted said motion as I stood in the well of the courtroom. I wrote last week of some ambivalence about this endeavor that was planned, with a group of 30 people from my listserv, as I struggled to justify an actual reason for traveling to Washington, D.C. for this appearance. That ambivalence existed because I’m not handling any case, at the moment, that has an issue that might land me there as counsel. 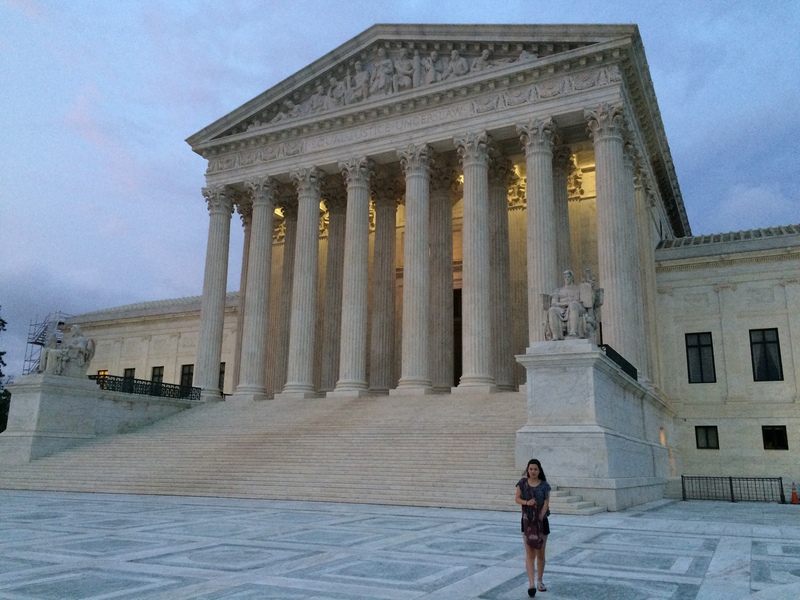 But I discovered the reason the night before, as I strolled over to the Court in the fading light of day with my 21st Century Daughter and took the photograph you see here of this magnificent temple of Justice, built of gleaming white marble. The prior days had been filled running around D.C. as my daughter explored college campuses, we darted into the Smithsonian, watched part of the Memorial Day parade, saw and heard roaring Harley’s in town for Rolling Thunder and silently explored memorials. Yesterday morning I went, with my daughter and listserv buddies, into the courthouse. We were escorted as a group to one of the grand conference rooms abutting the courtroom, and we waited. Our guests were then removed and seated in the court’s gallery. Want to know what the grown-up, lawyer equivalent is to a kid entering a candy store? 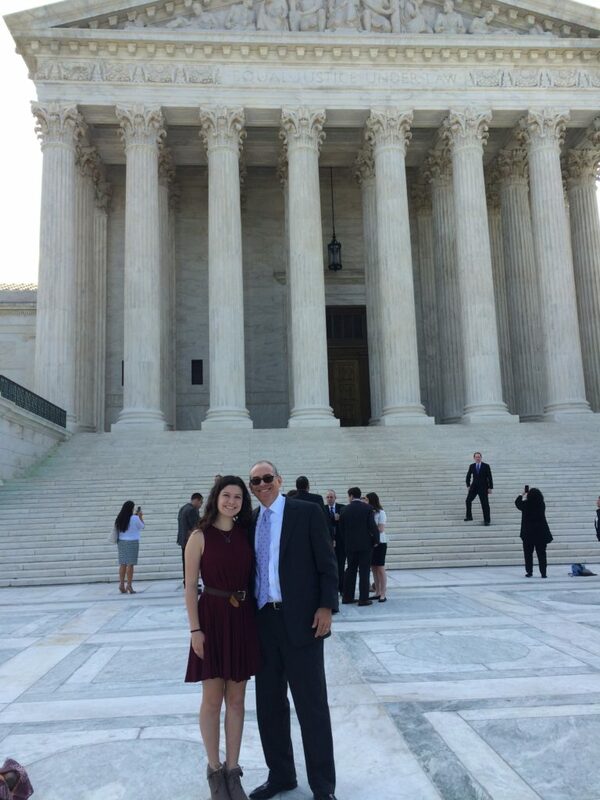 Yes, it is excitedly waiting to enter the nation’s highest court to be sworn in. A few minutes later, we were directed in, past the seated gallery, to seats inside the courtroom well — the same courtroom where my father was sworn in, in 1961, Chief Justice Earl Warren presiding. In came the justices, at 10:00 a.m. sharp, taking their seats. I scanned the familiar-from-the-news faces. 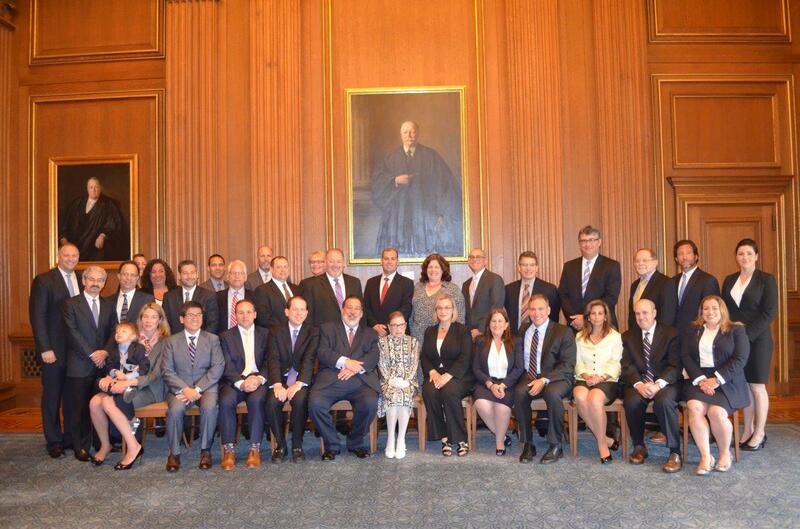 Kagan on my far left with Ginsburg near by, and Sotomayor on the right with Breyer near by. The center was filled with Chief Justice Roberts, flanked by those with seniority, Kennedy and Thomas. Only Alito was missing. And, of course, missing was a seat for any ninth justice. C.J. Roberts read a decision, from United States Army Corps of Engineers v. Hawkes Co., Inc.,(8-0, with four opinions). Five minutes later attorneys who were already members of the SCOTUS bar, one after another, rose to address the court and make a motion that their groups of attorneys be admitted. When our turn came, a somewhat surreal moment occurred, as we were addressed — officially by the highest court in the land — by our jokey listserv name. A group not officially associated with any bar association, university or other formal organization, without any legal structure, dues or secret handshake. Simply a private listserv for those who work in a similar niche of the profession: New York based trial lawyers. Appellate wordsmith Jay Breakstone, who has guest blogged here on occasion, and who set up the group admission to the court, made the motion, calling us each in turn, as we each rose. And C.J. Roberts had the clerk swear us in. By 10:13 it was all over. I tried to exit slowly so that I could admire the carved marble friezes up by the ceiling and the magnificence of the courtroom. The court officers would have none of that, however, hustling us all along. Back to our conference room. Then a little Brooklyn gal named Ruth Bader Ginsburg entered. She of diminutive physical stature and towering reputation, to talk with her fellow New Yorkers. She asked about our listserv, heard how solo and small practice lawyers can pool intelligence about cases and the law, and then sat for group photos. And the reason I made this journey was never more clear. While it is conceivable that I could one day find myself in this court as counsel, the odds are not exactly in my favor. Precious few attorneys ever have a case that makes it this far, and the stomach to stand in the well and argue, and you need to have both. But the reason we do things sometimes, is simply for the experience of having done it. That experience could be a movie or museum, an opera or sky dive. We may take away nothing tangible, other than, perhaps, a ticket stub, photo or certificate. The joy is in the experience itself. And as experiences go, my dear reader, I want you to know that being sworn in to the Supreme Court bar is a tough one to top for any attorney. How does one join your list serv? You have to personally know people on the list (not digitally, but in real life) who can vouch for your skills and qualities. And no, the list is not public.